Welcome to PRASM: What's Your 'Flavor'? Are you retro, abstract, urban, funky, fun, laid back, eclectic...? Are you simply a person who loves to add a bit of flavor to anything you rock? Remember the old adage, "less is more?" Well that bit of wisdom most certainly applies to our attire, too. If you look at the fashion world -both past and present- you notice that popular fashion critics tend to choose the understated "celebrity" style as some of their most favorite looks. The world's "style" icons usually are those who have mastered the understated look by not doing too much, nor doing too little. 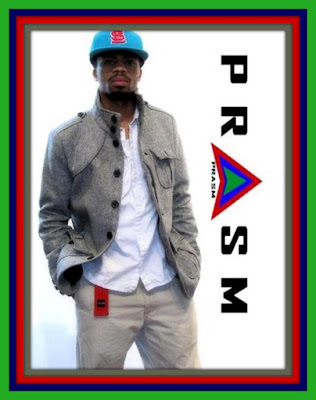 At PRASM, the saying, "less is more" definitely applies! PRASM belts are such a good choice because they don't overpower your look, nor do they go unnoticed! They add a perfect, vibrant touch to your flair. The wonderful thing about this is that you don't have to put a lot of thought into how you'd add more flavor to your look, but instead you can choose from a multitude of colored belts! Many of these colors (purple, blue, orange, green, etc.) can go well with a number of casual looks (regardless of what color you're already wearing). We are now in a fashion era where many are flowing toward a more abstract look -by blending "unusual" styles and colors together. PRASM is a great way to do just that! can come together perfectly, creating an urban vintage, yet modern look! Imagine this... You're rushing from the house to meet a friend for brunch. You simply want to throw on a pair of your favorite jeans (or khakis, as in the picture above)! You rock your jeans with one of your simple tops because you're not in the mood to get super fly or 'glammed' up... BUT you still want to turn a few heads or better yet, you want to add some flair to your look! This is where a nice, solid colored PRASM belt becomes your 'go-to' accessory! Your jeans and top go from a casual tone to one with a bit of edge and uniqueness, all without taking up too much of your time! So when you're scurrying out the door to meet friends, grab a solid colored belt (such as those featured in our PRASM collection) and let it take your outfit up a notch. On your leisure days you don't have to turn your style "off." No. Turn it "on" with something as simple as a quality made, richly colored belt. PRASM socks serve the same purpose as well, but it adds some "oomph" to your feet and shoe game. Our socks not only serve as a tool for style, but even better than that they fit very comfortably on the foot. So, whether for comfort or style, PRASM socks are a first choice for those who love the best of both worlds! Elevate your attire... simply. Just add some color at the waist and on your feet (if you dare be bold enough) and set your own trends!! PRASM is the Key To Casual, Effortless Style! Happy New Year from the PRASM Team!! !